Performers under the age of 18 MUST have consent of a parent or guardian in order to participate. The top 6 performers will be notified after the submission entry has ended. They will receive free registration for themselves to the convention, but will be responsible for providing their own hotel accommodations, food, transportation, parking and other related expenses. Group and solo acts are welcome to submit as long as they follow the guidelines of the competition. NO profanity or vulgar lyrics in any vocal performance or dance music will be allowed. NO pyrotechnics, open flames or acts requiring more than 14 FEET of ceiling height. A Sound Technician and microphone(s) will be provided. Performers MUST provide their own recorded music, props, etc., if needed at rehearsal. Recorded music MUST be on a CD or USB flash drive in an acceptable format (i.e. MP3 or WAV file). No changes to music or acts after rehearsal. All contestants must perform the same act or musical selection exactly as their video audition. This includes number of people in the act (if a group of performers). Keep attire at a respectable and tasteful level. NO alcohol, tobacco, or drug advertisements are to be shown on any clothing. MAS-ICNA reserves the right to CANCEL or RESTRICT a particular performance, even if the performance does not violate a rule. The decisions made by judges or the show’s management in setting rules or evaluating a performance are usually considered final and are not subject to complaint or alteration. Once selected, performers will need to sign a contract in which, if violated, will be subject to legal actions. NO EXCEPTIONS WILL BE MADE TO THESE RULES! Rules are subject to change at the sole discretion of the Talent Show organizers. ​American Muslims Got Talent Season 3 is open to all acts. If you have what it takes, bring it on! Competition is now closed. Come out and see the show on December 30th 2018! how do i enter the talent show? Competition submission period is now CLOSED. Please check back next year to enter for Season 4! IS THERE A FEE TO ENTER THE TALENT SHOW? Yes, there is a $25 non-refundable fee to enter the talent show. ​WHY IS THERE A FEE TO ENTER THE TALENT SHOW? The small fee helps cover a portion of what it costs to put on a large scale talent show in front of 20,000 people. If you’re under the age of 18, you must have the permission of your parent or guardian. WHAT ARE THE TALENT SHOW JUDGES LOOKING FOR? WHAT HAPPENS IF I MAKE IT TO THE TOP 6? The top 6 finalists will audition in person at the MAS-ICNA convention for a shot at the main stage on Sunday night. WHAT HAPPENS IF I MAKE IT TO THE TOP 3? 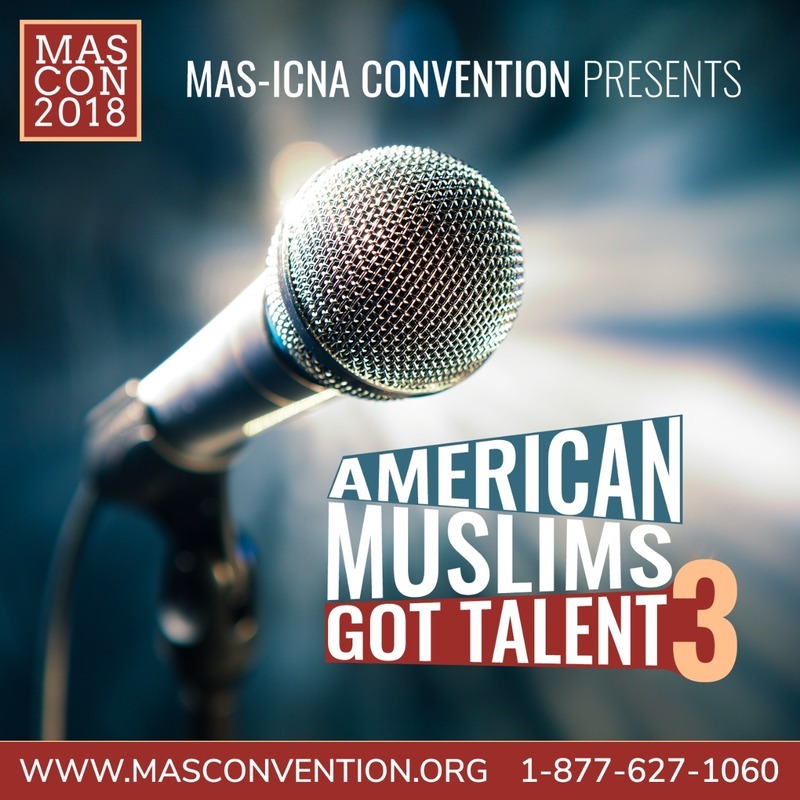 The top 3 finalists will perform in front of a live audience during the MAS-ICNA convention and will be awarded prizes based on first, second and third place.